The CUB5 provides the user the ultimate in flexibility, from its complete user programming to optional set point control and communication capability. The meter can be programmed as a single or dual counter with rate indication capability. The display can be toggled either manually or automatically between the selected displays. The CUB5 display has 0.46" (11.7 mm) high digits. The LCD is available in two versions, reflective (CUB5R000) and back light (CUB5B000). The back light version is user selectable for green red back lighting with variable display intensity. The counter is programmable for one of eight different count modes, including bi-directional and quadrature. When programmed as a dual counter, each counter has a separate scale factor and decimal points. In the counter/rate indicator mode, each has their own scaling and decimal point read-outs in different engineering units. The internal batch counter can be used to count set point output activations. The meter has two separate inputs which provide different functions depending on which operating mode is selected. Input A accepts the signal for the Count and/or Rate displays, while Input B accepts the signal for the Count Display or direction control. IN the anti-coincidence mode, both inputs are monitored simultaneously so that no counts are lost. The resulting display can be chosen as the sum or difference of the two inputs. 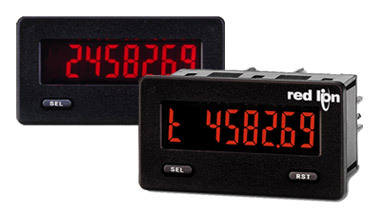 The Rate Indicator has programmable low (minimum) and high (maximum) update times to provide optimal display response at any input frequency. There is a programmable user input that can be programmed to perform a variety of functions. The capability of the CUB5 can be easily expanded with the addition of option modules. Set point capability is field installable with the addition of the single set point relay module or the dual set point solid state output module. Serial communications capability for RS-232 or RS-485 is added with a serial option module.